Rakusan did not include the Fan Series in his main sequence numbering. Therefore, the original number used for each of the 36 Series prints has been modified to identify the Fan Series members of its theme. The five different fan silhouette shapes have been here assigned arbitrary numbers 1 through 5. To indicate a fan design these shape designations are added to the 36 Series number separated by a hyphen. 108-1 is the Fan Series design with fan shape 1 in the 108 Goldfish and Medaka theme. Like all other designs in this series, 108-1 was only produced in a single print run, and few copies are currently documented. The individual designs in the 108 Goldfish and Medaka theme were completed in at least two stages. Three of the five fan designs have seal C which indicates a carving date during the first half of 1934. However, the other two fan designs (including 108-1) and the 36 Series design 108 all have seal B which indicates a later carving period closer to the time of publication. 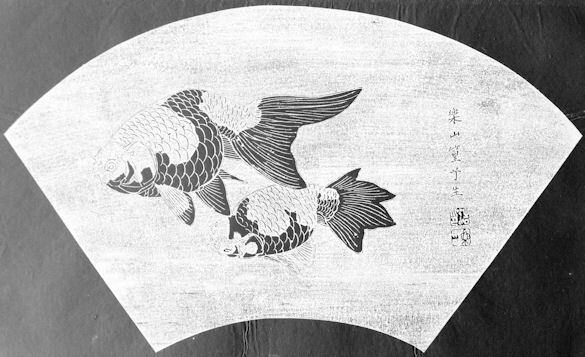 The composition of 108-1 includes only two goldfish which are viewed as through the side of a glass container. 108-1 is one of only a few early designs where Rakusan has modified the carving so that the natural patterns of light and dark are preserved in the ishizuri version. 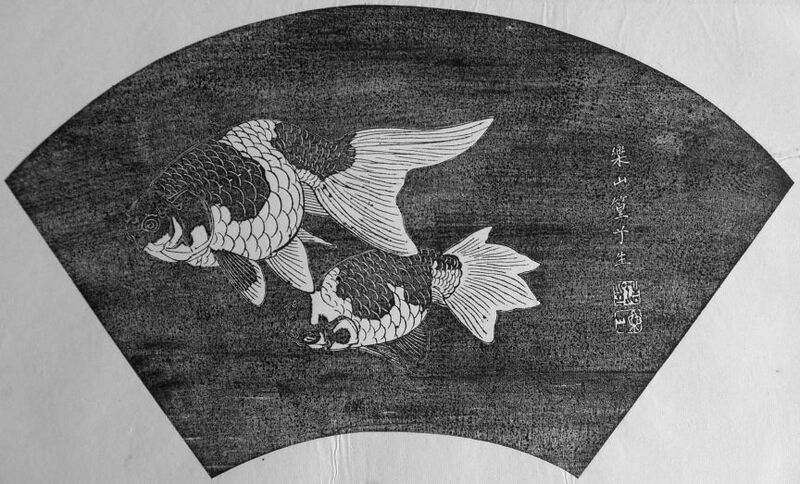 Normally in the ishizuri version the areas of dark and light would be the reverse of the original sketch (which here was of fish with dark backs and light undersides and light tail tips). As a result of this carving decision, Rakusan had to outline the edges of the goldfish shapes. This extra outlining makes the composition look stiff, and as a result the technique was abandoned in later carvings.